We have reviewed some of the top-rated fishing reels on the market to find you the Best Baitcasting Reel Under 200. After reviewing many of the top-rated fishing reels on the market, we found Abu Garcia Revo SX Gen 3 to be the Best Baitcasting Reel Under 200. Abu Garcia is very well known for their baitcasting reels. And, Revo Gen 3 SX is one of their best-selling models. Revo 3 SX is a lightweight and affordable baitcasting reel with many features. It is extremely high on performance, power, and durability. It is easy to use and comes in an attractive design. Abu Garcia Revo SX weighs only 6.65 (oz) which is 25% lighter than before. It has a gear ratio of 7.1:1 with 29 inches per turn. This reel has a max drag power of 20 lbs. making it easy and effortless to reel in a big catch. The Rvo3 SX has a mono capacity of 145/12 (yds/lb.) and a braid capacity of 140/30 (yds/lb.). Inside the box is a safely packaged fishing reel that comes with a description page explaining the features about the reel. Revo Gen 3 SX also have a lube port which is something the earlier models did not have. Because of its lightweight, the Revo Gen 3 SX performs much easier and smoother than before. The brake system in the reel also allows you to cast the most accurate line possible without any backlash. The Carbon Matrix system ensures an effective yet smooth drag with low–friction. Thanks to this Matrix system, you can expect there to be almost no backlashes. The Revo SX baitcasting reel has a MagTrax brake system to give you a reliable brake pressure. Also, the magnetic brake system is easily modifiable from the outside of the reel. This means you do not have to take apart the side plates just for simple altercations. With MagTrax, a turn of the dial moves the magnetic braking system closer to the spool which allows for additional cast control. Abu Garcia Revo SX baitcast reel has a gear ratio of 7.1:1 and 29 inches per turn. This reel has a standard speed that works best when reeling in a medium sized fish than compared to a bigger one. The D2 Gear system gives you a much more efficient design and durability. If you look around the D2 Gear system may be the most durable ever made. Revo 3 SX reel comes with 9 stainless steel ball bearings and 1 roller bearing offering you a clean operation with little to no effort needed. These bearings go hand in hand with the Titanium-coated line guides to reduce friction. Because Revo 3 SX has 9 ball bearings, casting and retrieving becomes smooth and effortless. Abu Garcia Revo 3 SX is so lightweight it is easy to use and handle even on longer fishing days. Not only that, thanks to the MagTrax brake system, there is no need to take off the side plates for adjustments. The Carbon Matrix allows for smooth drag saving you extra energy. And the D2 gear gives you to a strong and durable performance. The dimensions of Revo 3 SX are 5.9×3.2×5.9 inches, with a weight of just 6.65 oz. Although the Revo 3 SX is lightweight it is still extremely durable and strong. It is built with a C6 carbon handle side plate which provides excellent strength and gear alignment. A corrosion-resistant X2 alloy frame helps avoid rusting from any harsh weather conditions. On top of that, the line guides are titanium coated. Titanium is applied as a thin coating and once hardened it provides a strong layer of protection for the line guides. Abu Garcia Revo 3 SX Gen 3 has a stunning design! It is fashioned in a sleek combination of black, charcoal grey, and red. This gives it a subtle yet edgy appearance. Revo SX reel also has a compact bent handle of 80 millimeters. It comes with rubberized knobs for a comfortable yet strong and powerful grip that does not slip. And the fact that it is cheaper than most baitcasting reels out there makes it the perfect choice for any angler. If you wish to get the most of your money then Abu Garcia Revo 3 SX should be your reel of choice. It is much smoother and efficiently than most competing baitcasting reels out there. Once you get a hang of it, you will never go fishing without Revo 3 SX. Any experienced angler would tell you that to you need to avoid heavy, weak, or flawed reels. Although Revo 3 SX weightless, it is strong and durable. It may even make you wonder how can it be weightless yet so efficient! But after using it and adjusting it as per your liking, you will realize that nothing can beat this fishing reel. There are not many reels out there that include everything that this Revo3 does. 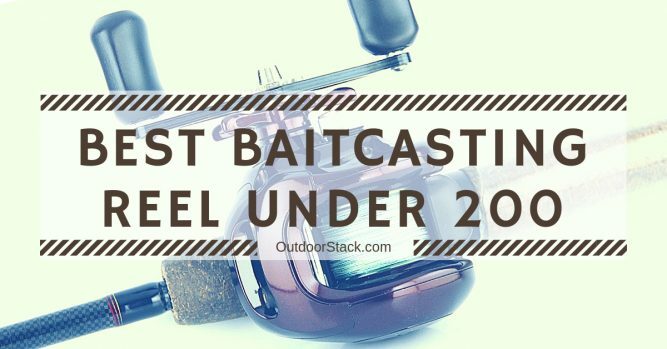 We hope you liked our recommendation of the Best Baitcasting Reel Under 200. If you have any other suggestion then please let us know via the comments section. We will try to including your suggested baitcasting reel in our next update.